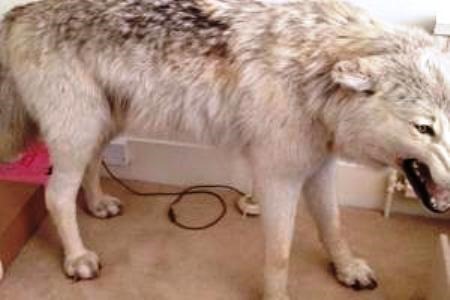 Police are searching for a three foot high, six foot long Arctic wolf believed to have been stolen from a flat in Chelsea. The beast "is white and speckled with black over its back, shoulders and ears." Thankfully for other Londoners, the animal is stuffed so dentists can put their hunting guns away. The specimen worth £32,000, was bought six years from a taxidermy shop. "It has an open 'snarling' mouth and yellow glass eyes. It has white fur with black speckles on back, shoulders and ears" say Kensington and Chelsea Borough CID. The female victim had been out with a friend in Soho returning home at about 4.00am on Monday 3 August. Both girls came back to the flat in SW10 with three men they had met earlier in the evening. The three white men in their twenties left at about 5.00am. Later in the morning, the victim discovered her stuffed Arctic wolf was missing. "This is a unique item and I am appealing to anyone who may know the three suspects or have information about the stolen Arctic wolf to contact police" said Detective Sergeant Sean Lyons. Anyone with information on this incident is urged to contact DS Sean Lyons at Kensington and Chelsea CID on 020 8246 0189 or police on 101. To remain anonymous contact Crimestoppers on 0800 555 111.